By Ashton Lewis, Master Brewer, Springfield Brewing Co.
Two of my favorite times in the brewhouse are the mash-in and the kettle boil. These steps share several traits. For starters, they release wonderful aromas into the air enhancing the aesthetic experience of brewing. At the same time, they constitute the two key steps that separate brewing from the making of wine. But the “hot” processes of brewing introduce one other difference between beer making and wine making. As brewers, our facilities experience conditions with the potential to undermine the corrosion resistance of common stainless steel alloys. While few in our segment of the industry have yet to experience it, under certain conditions, the application of heat to stainless steel vessels can lead to a ruinous condition called “stress corrosion cracking” (SCC). What is Stress Corrosion Cracking? Stress corrosion cracking is a general term describing stressed alloy failures appearing as cracks in the stainless steel that occur in corrosive environments. Corrosion of this type has been extensively studied and affects almost all metal alloys, including the austenitic grades of stainless steel used in brewing. There are several mechanisms used to explain the metallurgy of SCC but no agreement among experts as to which mechanisms are operative in stainless steel. As a result, the literature discusses cracking that occurs in association with specific corrodents, including chloride, caustic and oxygen. But heat and a corrodent and are only two factors required for SCC. Overall, five conditions must simultaneously be present for SCC to occur in a susceptible material: 1) a specific corrosive agent or corrodent, 2) tensile stress, 3) temperature greater than 125F (32 C), 4) oxygen and 5) time. As mentioned above, the corrosive agents include several commonly found in brewery environments such as chloride, caustic and oxygen. Both chloride and caustic SCC can occur in breweries, with chloride being by far the most common. While chloride may enter the brewery via foundation water or water salts, the most troublesome source is usually insulation material around brewery vessels. Many insulation products like urethane foam contain significant quantities of chloride. When these materials get wet, chloride can dissolve and be deposited on adjacent stainless steel surfaces at high concentrations. Figure 1 shows data on the susceptibility of type 304 stainless steel to stress corrosion cracking under certain conditions. Caustic-induced SCC can occur in breweries where concentrated caustic solutions are held hot for prolonged time periods. Although few breweries store concentrated caustic hot, the condition can easily occur in CIP systems. For example, concentrated caustic is found around leaky valves and fittings and caustic cracking can occur if the caustic storage tank is kept hot. The second condition needed for SCC is tensile stress – a condition that occurs any time a metal is bent. Tensile stress is usually created during fabrication of the vessel or part. Dimples on heat exchange surfaces would be a good example of a place where tensile stress is found. The remaining conditions are easily understood and commonly present in the brew house. High temperatures are unavoidable in brewing. Oxygen is hard enough to keep out of beer after wort aeration and impossible to eliminate from the brew house environment. And of course time cannot be stopped. Unfortunately, the stainless steel grades most susceptible to SCC include those most often used in brew house fabrication, types 304 and 316 and their low-carbon cousins 304L and 316L. As a result more SCC failures will occur in the craft-brewing segment of our industry as time passes. The fact that few craft brewers have had to experience SCC is not a sign of immunity-rather it is a reflection of the relatively young age of our industry. As brewers we read about and understand some brewing problems that we rarely see. For example, we all know about “rope” formation in bottled beer but how many times have you bought a bottle of ropey beer? My guess is never. Stress corrosion cracking, on the other hand, does happen. I know of many real examples of SCC occurring in breweries through the literature as well as from conversations with my colleagues at Paul Mueller Company, fellow brewers and brewery engineers. The following list is a summary of some real cases of SCC seen in breweries. Hot water tanks and hot water pipes – SCC can attack the inside surface of hot water tanks and pipes as well as the exterior heat transfer surface of hot water tanks. One brewery experienced SCC failure in a hot water tank built of type 304 stainless after only 2.5 years of service. The water contained 300 ppm of chloride and was held at 175 F (79 C). SCC also occurs in hot water tanks where heaving scaling has been allowed to develop as chloride is concentrated in these deposits. 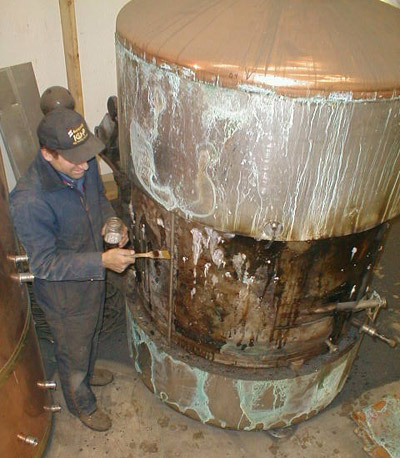 Mash mixer and cookers – most failures in mashing vessels occur on the exterior heat transfer area. The incidence of this type of failure is most common in larger breweries where equipment is used almost continuously. The source of chloride in these failures is usually the insulation, which is wetted by a leak in the heat transfer surface by exterior sprays. Brew kettles – Several cases of SCC in brew kettles have popped up lately in the craft segment of the industry. Like mash mixer and cooker failures, the source of chloride is usually the insulation or wetted insulation and is concentrated when the insulation is repeatedly wetted and dried. Liquid Adjunct – Tanks and Pipes – Liquid adjuncts like hydrolyzed corn starch frequently contain chloride and are typically stored hot to allow for pumping. SCC in type 304 adjunct tanks and pipes has occurred in breweries utilizing these ingredients. Unfortunately, the first sign of SCC may be complete vessel failure. Alternately, you may see cracks and small leaks. It’s tempting to repair these seemingly minor manifestations by welding. But welding only serves to exacerbate the problem by increasing the quantity of cracks in the SCC affected material, resulting in a spider’s web of cracks. Once stainless steel experiences stress corrosion cracking there is no method to reverse the process. The best way to cope with SCC problems is to replace all or part of the damaged equipment. If the cause of failure is known, then the conditions leading to the corrosion should be eliminated or the repair should use material more resistant to SCC. Elimination of SCC-causing conditions means removal of one of the five elements identified earlier. Time, oxygen and heat are unavoidable. In addition, tensile stress cannot be eliminated in most cases either. With these four elements removed, we are left with the corrodent. Thus the one thing that we can do for in-place equipment is to remove or minimize contact with the specific corrodent. Careful attention should be paid to insulating materials used on brew house vessels since they are one of the most common sources of SCC-causing corrodents. Many insulating materials and insulation adhesives contain water-soluble chlorides. To prevent their concentration on stainless steel surfaces, two issues should be investigated. First, insulation intended for hot applications should be chloride-free. Second, water should be completely prevented from contacting insulation through the use of an appropriate sealed outer jacket that covers the insulation. If, for example, a brew kettle or hot water tank is located in an area that routinely gets cleaned using a hose, the best outer jacket would be one that is fully welded to keep water away from the insulation. Unfortunately, many outer jackets are riveted instead of welded and rivets do not make the jacket impervious to water. If corrodent contact cannot be removed, we must accept the fact that certain vessels may require replacement after a limited service life. When such replacements are made, or when new equipment is being specified, brewers have the opportunity to select a stainless alloy that is more resistant to SCC than types 304, 304L, 316 and 316L. The most effective solution to preventing SCC is to select an SCC-resistant stainless steel. Examples include alloy 2205, alloy AL-6XN, type 444 and carbon-clad steels. Alloy 2205 is a duplex steel with excellent resistance to SCC and pitting and crevice corrosion. 2205 is difficult to equip with exterior heat transfer and has been used for hot water tanks with internal steam coils or external heating loops (usually an external plate heat exchanger heated with steam). Alloy AL-6XN is an austenitic steel containing 20 percent chromium, 23.5 percent nickel and 6 percent molybdenum. AL-6XN has excellent fabrication qualities like types 304 and 316, has excellent resistance to pitting and crevice corrosion as well as the added resistance to SCC. Due to the relatively high content of nickel and molybdenum, AL-6XN is an expensive alloy. Type 444 is a ferritic steel and has excellent resistance to SCC, like most ferritic grades, and contains 1.75 percent molybdenum for improved resistance to pitting and crevice corrosion. Carbon-clad steels are two-ply steels. Many large breweries have addressed SCC problems by using a stainless/carbon two-ply plate material in brewhouse applications. The carbon steel portion has excellent resistance to SCC, has very good strength and is cheaper than stainless steel. The price difference becomes significant in large brewhouse vessels where the material thickness on the bottom head and lower shell sections typically exceeds one-half inch. Clad material is installed so that the exterior of the vessel is carbon steel with carbon steel heat transfer and the inner surface is usually type 304 or 316 stainless. Building equipment from SCC resistant alloys may be the safest approach, but it is not always economically feasible. Many SCC problems can be avoided by using good design practices before building equipment, such as insulation selection and installation. Sometimes tanks intended for hot applications are covered with protective coatings prior to insulating the tank in an attempt to prevent corrosion beneath insulating materials. These coatings are similar to under-coating an automobile. While they can be effective, coating selection and application methods are critical for proper performance. For example, zinc-rich primers give very poor performance when used under insulation and if protective coatings are scratched corrosion can occur beneath the coating. One coating that is fairly common and has a good record in the field is Thermalox. Finally, some brewers are aware of the potential for SCC and build hot vessels from austenitic steels knowing these vessels may need replacement after some years of service. This decision makes sense to some users because it is cost effective upfront and if the vessel life exceeds the depreciation period, there are no unexpected replacement costs. The take-home message is that stress corrosion cracking is a well-documented form of stainless steel failure and that the austenitic grades commonly used to fabricate brewing equipment are among the most susceptible steels to this form of corrosion. Many of us will never personally encounter SCC problems with our equipment. But like a fire escape plan, it is prudent to be aware of the potential risks and to do what we can at each stage of brewery planning and operation to minimize its effect on our facilities. There are several options for dealing with SCC. Some options may be more viable than others; could you physically get your vessel out and install a new one? How important are the visual brew house aesthetics? Replace the kettle – Brewery equipment fabricators can build you a vessel to match the one that has experienced the failure. Shop the used equipment market – There are a number of used small brew houses available today. You should expect to pay less than 50 percent for equipment in decent shape-however process piping will need to be reworked for this option. Add an exterior heating loop- Hot Liquor Tanks can utilize and exterior loop consisting of a small recirculation pump and heat exchanger. Wort boiling can be accomplished in a device called an exterior calandria. Add interior heat surface – Interior heat transfer surfaces such as rolled tubing may be installed. They have a slight impact on the whirlpool operation, but this may be the fastest and most inexpensive repair option. If stress corrosion cracking is occurring in the craft brewery, it is most likely due to soluble chloride coming from the insulation. Likely sources of soluble chloride are water penetrating the cladding or from a small stream leak in the vessel. Brewers would be well advised to try to prevent water transport by dealing with steam leaks and sealing cladding penetrations before they become an issue. 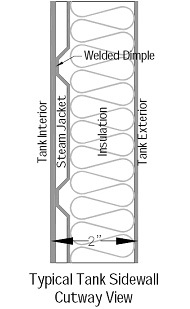 The steam jackets are the most likely place for a vessel to fail first. This is due to a number of reasons including the fact that these jackets are commonly constructed of relatively thin metal. In addition, they are the hottest part of the vessel and small stream leaks will cause additional transport of chlorides from the insulation to the metal. Repairing a vessel with alternate steam transfer surfaces can drastically slow or even stop the process of SCC. By not using that leaking steam jacket you are also removing the source of the chloride transport moisture. By not heating the jacket you have also reduced one factor (heat) required for SCC to progress. Although there are hundreds of stainless steel alloys available for countless applications, breweries routinely use only a few general-purpose types. The most common stainless alloy is type 304 and contains at least 18 percent chromium, eight percent nickel and no more than 0.08 percent carbon, two percent manganese, one percent silicon, 0.045 percent phosphate and 0.03 percent sulfur. Nickel promotes the stability of austenite, aids the formation of passive film and increases toughness, ductility and ease of welding. Type 316 contains at least 16 percent chromium, 10 percent nickel and two percent molybdenum and no more than 0.08 percent carbon, two percent manganese, one percent silicon, 0.045 percent phosphate and 0.03 percent sulfur. The most notable difference between type 304 and 316 is molybdenum. Type 316 is alloyed with molybdenum for improved pitting and crevice corrosion resistance. Almost all austenitic steels are available in so-called “L grades.” The L grades, for example 304L and 316L, contain no more than 0.03 percent carbon. The carbon content of stainless steel effects a phenomenon known as “sensitization.” At certain high temperatures, chromium-rich carbides will form in carbon-containing stainless steels. This sensitization depletes the chromium content of the surrounding steel making it susceptible to certain types of corrosion. This phenomenon can occur during steel production, welding or in steels used for high temperature service. When caused by welding, it is known as “weld decay” and the area around the weld is known as the “heat affected zone.” Low carbon steels effectively prevent sensitization. Regular alloys affected by sensitization can be annealed to dissolve the carbide and then rapidly cooled. The most general definition of stainless steel is an alloy of iron and chromium, with at least 10.5 percent chromium. 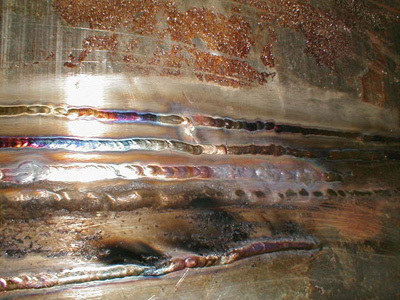 When exposed to oxygen or oxidizing solutions, such as nitric acid, stainless steels form a thin, protective “passive film.” Although the passive film is commonly called a chromium oxide layer, it is not a true oxide film like rust; scraping the surface of stainless steel will not result in chromium oxide dust. Stainless steel is divided into two general classes based upon the atomic crystalline structure. Ferritic steels are magnetic and the atoms are arranged in a body-centered cubic arrangement. In general, ferritic steels lack intentional additions of nickel, cannot be hardened by heat treating and are only slightly hardened by cold working. Most ferritic grades lack toughness and are typically used in light gauge applications, for example in automotive exhaust systems and kitchen surfaces. Some ferritic grades, for example Type 444, are exceptions to this generalization. Austenitic steels are not magnetic and the atoms are arranged in face-centered cubic arrangement. Unlike ferritic grades, austenitic steels do contain nickel (with the exception of some special alloys that substitute manganese for nickel), have excellent workability and are hardened by cold working, imparting toughness. Austenitic is by far the most common type of stainless steel. Most brewing vessels are fabricated in a similar manner. It is helpful to understand how your vessel was built in order to formulate an effective plan for dealing with problems like SCC. B.F. Brown, Stress Corrosion Cracking Control Measures, National Bureau of Standards Monograph 156, U.S. Government Printing Office, Washington, D.C., 1977. R.M. Davidson and J.D. Redmond, Practical Guide to using 6Mo Austenitic Stainless Steel, Nickel Development Institute Technical Series Number 10 032, 1989. W.Z. Friend, Corrosion of Nickel and Nickel-Base Alloys, John Wiley and Sons, Inc. New York, 1980. J.D. Redmond and K.H. Miska, The Basics of Stainless Steels, Chemical Engineering, October 18, 1982. J.D. Redmond, solving Brewery Stress Corrosion Cracking Problems, MBAA Technical Quarterly, Volume 21, November 1984. A.J. Sedricks, Corrosion of Stainless Steels, John Wiley and Sons, Inc., New York, 1979. I wish to thank Harry Barbee, David Rowe, Matt Detelich and Jerry Codutti of Paul Mueller Company for sharing their years of practical experience with stainless steel and for allowing me access to the references used in this article. Special thanks goes to co-author John Mallett who recommended me for this assignment. Ashton Lewis is the Staff Master Brewer in the engineering group of Paul Mueller Company located in Springfield, Missouri and is the Master Brewer of the company’s Springfield Brewing Company. Ashton holds a B.S. in Food Science from Virginia Tech and a M.S. in Brewing Science from UC Davis. John Mallett is responsible for the production of the fine beers made at Bells Brewery in Kalamazoo, MI. John has served in numerous capacities over his brewing career; he was head brewer of Boston’s Commonwealth Brewery, Brewmaster at the Old Dominion Brewing Co in Ashburn VA and founder and President of SAAZ, an equipment and service provider for breweries both large and small. John has lectured and written extensively and serves on various technical committees and is a widely known consulting resource. He is a graduate of the Siebel Institute and serves as a member of the extended faculty there.